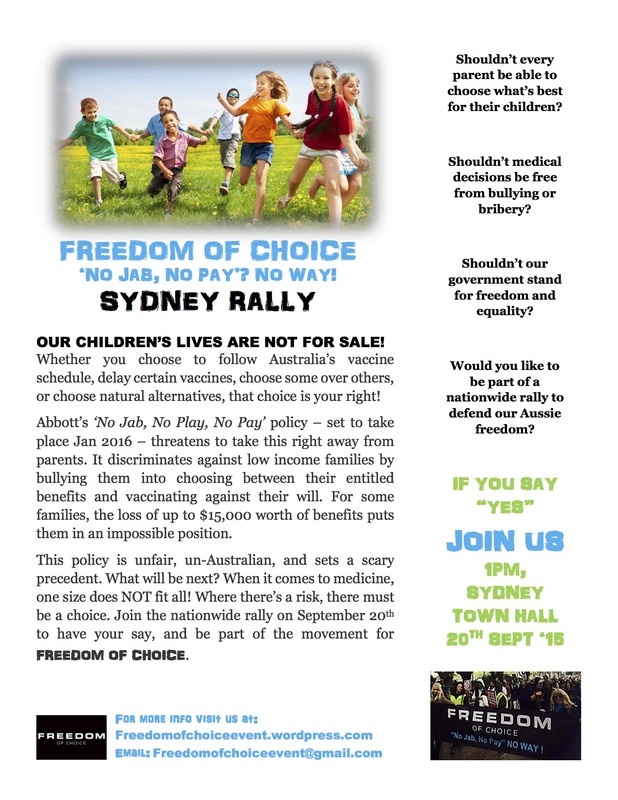 Freedom of Choice Sydney rally – ‘No jab, no pay’? No way. Where there’s a risk there must be a choice. 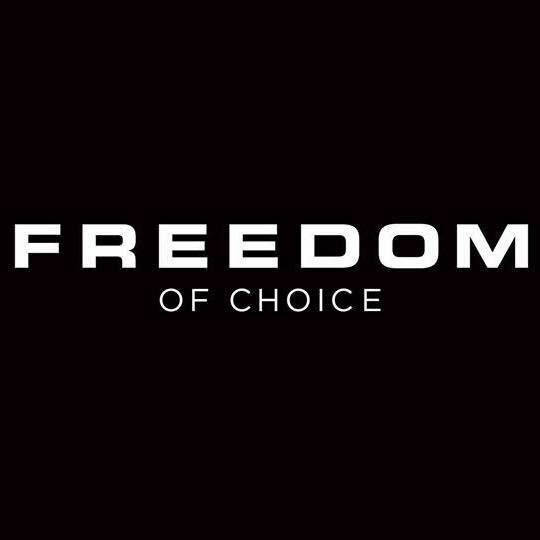 On September 20th 2015, Sydney joins the nationwide Freedom of Choice rallies, 1pm at Town Hall, in protest of Tony Abbott’s fascist and discriminatory proposed ‘No Jab, No Play, No Pay’ policy, allegedly set to take effect January 2016. The protests will be held simultaneously in Sydney, Melbourne, Brisbane, Perth, Adelaide, Canberra, Tasmania and Noosa. Attendees include abroad coalition of academics, health care professionals, parents and concerned citizens of both pro- and anti-vaccination camps. Whether parents choose to follow Australia’s vaccine schedule, delay certain vaccines, choose some over others, or choose natural alternatives, that choice is their right! The Liberal government’s proposed policy threatens to take this rightaway from parents, confiscating exemptions under conscientious and religious grounds. It discriminates against low income families by bullying them into choosing between their entitled benefits and vaccinating against their will. The ramifications of this for human rights in Australia will be significant; where the right to choose or refuse medical treatment will be afforded to the rich, but not the poor. It is unfair, un-Australian, and sets a scary precedent. If the ‘No Jab, No Play, No Pay’ policy is passed, what will be next? Where the pharmaceutical companies are not legally liable for adverse reactions, where the Australian government offers no compensation scheme, where there is an absence of proactive screening measures to minimise the risk of adverse reactions, and when it is proven that one size does not fit all… there must be a choice. For some families, the loss of up to $15,000 worth of child-care and family tax benefits and the threat of exclusion of their kids from childcare and even schools puts them in an impossible position. It mandates parents to choose between vaccination and education. Implications on single parents in particular is appalling; many will have to leave the workforce to either home-school or look after their children, relying on welfare benefits as their only source of income. Even more disturbing, is in caseswhere there is a familial history to adverse reactions, parents are then asked to puttheir other children at risk or suffer. This policy forces families into medical compliance by means of bribery, bullying and intimidation. When it comes to medicine, one size does NOT fit all. So why is this the government’s stance on vaccines? Whilst vaccines can have positive contributions to public health, and do play a part in the wellbeing of some, the truth is that some have also been the cause of irreversibleand lifelong damage. The World Health Organisation states that injuries resulting from vaccination can be “severe” and can require a lifetime of care, which is why it is an “ethical necessity” that a compensation scheme be in place. Unlike the USA – which has a Vaccine Injury trust fund – Australia has no such scheme. Abbott’s policy is a violation of the UNESCO Declaration on Bioethics and Human Rights. According to Article 3.1 and 3.2 of this declaration, ‘human dignity, human rights and fundamental freedoms are to be fully respected [and] the interests and welfare of the individual should have priority over the sole interest of science and society’. According to Michael O’Neill, founder of the newly formed “Involuntary Medication Objectors party” (IMO), “The impact on freedom and parents rights has staggering implications, and it is our commitment to oppose these laws and uphold the freedoms our forefathers died for”. The oversaturation of ‘pro’- versus ‘anti’-vaccine rhetoric has created an irrefutable polarisation whereby people are forced to choose sides. Just as every child is unique, every parent does – and must – have the right to choose what’s best for their specific child. At the heart of the issue, parents on both sides of the debate have a fundamental desire to keep their children safe and healthy. The question we should be asking is: when it comes to vaccines, should parents have the right to say no or not yet? We believe the answer is a resounding YES! Where there’s a risk, there must always be a choice. This will be our second rally in Sydney. The first one was a huge success and we are gaining momentum with followers of this cause to tell the Government we are not happy with their decision to take our FREEDOM OF CHOICE away from us in relation to health care for our children. We will not be coerced into medicating our children and our families and we MUST send a strong message to the Government. THIS RALLY IS ABOUT PRO CHOICE and HUMAN RIGHTS. The choice you make after fully investigating the issue should be honoured and respected. There should be no intimidation, coercion or ridicule when it comes to your health, or that of your family.